Since I began performing and touring I have encountered countless artists over the years. The genres are always different, and the members and their personalities are always as intriguing as their sounds. From the swamps of Miami to the highways of Japan there are millions of undiscovered artists simply waiting to be heard. No matter what your preference I hope to expose you to some of the most amazing sights, sounds, and tastes of The Montgomery Drive. For the first post in The Montgomery Drive I felt it would be best to share one of the most unique bands I have ever known and seen. 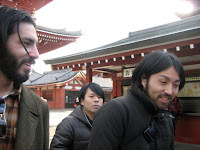 This past March following the Earthquake/Tsunami Disaster, I traveled alongside my friends Unfair Roots to Tokyo, Japan. After arriving as the first Americans to tour the island following the disaster, we met and played with some of the sweetest and most diverse groups I’ve had the privilege of sharing the stage with. Our dear friends and hosts on our journey were a band called “S-Explode”. Hailing from Saitama, “S-Explode” fuses a multitude of genres together creating a complex blend of sounds and tones that can only be described as a sound all their own. The band is a four-piece consisting of Hiroyuki, Kenta, Naoto, and Tetsu. Hiroyuki is the vocalist, singing and screaming while dancing, jumping, and swinging across the stage. Kenta is the guitarist, banging his head and swinging his guitar around effortlessly while playing complex scales and intricate riffs. Naoto jumps around the stage, bobbing his head as he lays down flawless bass lines full of thick groovy scales and crunchy fills. Lastly, Tetsu (or “The Beast from the East” as I called him) plays the drums utilizing odd time signatures and insane drum rolls. Every night watching “S-Explode” was an experience and adventure. There are not many bands that can have this effect. In our time together I came to feel very much in the company of brothers connecting not only with their loving personalities but also to their mind-blowing sound. On my journey I took numerous videos documenting our tour together. 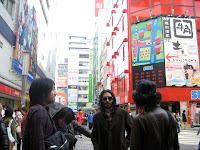 To check out a video of their set from the last show we played together in Tokyo watch below.